In a paper just published in Molecular Cell, Dominka Kwasna from Yogesh Kulathu’s group at the MRC PPU, in collaboration with Ian Gibbs-Seymour at the University of Oxford, reports the discovery of a completely new class of enzymes that is important for protecting the cell’s DNA from damage. The posttranslational modification of proteins with ubiquitin regulates the function of many proteins and thereby most processes in eukaryotic cells such as cell division, DNA repair, endocytosis and protein degradation. As ubiquitylation is so prevalently used, it is important for this modification to be tightly regulated. Enzymes called Deubiquitinases (DUBs) are proteases that carry out the critical role of regulating ubiquitin signals by removing ubiquitin from proteins in the cell. The action of DUBs thereby modulates the ubiquitin signal, and hence the functional response produced. Given their central importance in regulating ubiquitin signalling, there is considerable interest in pursuing DUBs as therapeutic targets in several diseases. Two years ago, Yogesh’s group discovered the MINDY family of DUBs as a distinct class of enzymes that are highly selective at cleaving K48-linked polyubiquitin, the signal that targets proteins for degradation. At that time, it was an unforeseen discovery as it was widely believed that all DUBs had been annotated. Following this unexpected discovery of the MINDY DUBs, they wondered if there were other DUBs yet to be discovered. Dominika therefore established a robust chemo-proteomic pipeline which recovered the majority of human DUBs from cell extracts. In addition, she repeatedly observed the presence of an uncharacterized protease called c6orf113 or ZUFSP (Zinc finger containing UFM1 protease). Intrigued by this finding, Dominika performed biochemical assays which suggested that ZUFSP may be a new DUB. 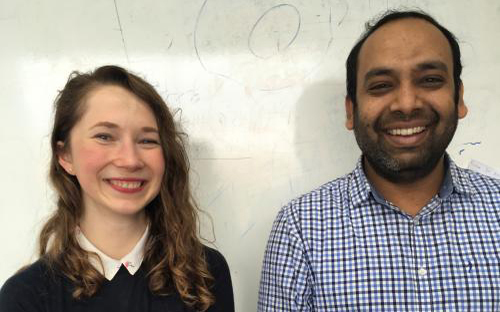 Working together with Syed Arif Abdul Rehman who determined the crystal structure of ZUFSP in complex with ubiquitin, Dominika’s analyses revealed how ZUFSP functions as a DUB. Moreover, the structure defines ZUFSP as a new class of DUBs distinct from other annotated DUBs. A vital clue to the cellular functions of this completely uncharacterized new DUB came when Dominika found that this nuclear localized DUB interacted with several proteins involved in DNA replication and repair. In collaboration with Ian Gibbs-Seymour and Ivan Ahel at the University of Oxford, they found that ZUFSP localizes to sites of DNA damage. Detailed analyses revealed that ZUFSP is a novel regulator of DNA repair and genome stability. ZUFSP is essential to prevent spontaneous DNA damage and also promote cellular survival in response to exogenous DNA damage. Ian Gibbs-Seymour has been awarded a CRUK Career Development Fellowship to begin his own independent laboratory at the Department of Biochemistry, University of Oxford, with a focus on understanding how post-translational modifications regulate replication-coupled DNA repair. Loss of ZUFSP in human cancer cells both causes endogenous DNA replication stress and sensitises cells to further exogenous DNA damage. These exciting findings suggest that ZUFSP could be a rational target in anticancer therapies. Future work will reveal the precise mechanisms by which ZUFSP maintains genome integrity and studies using models to monitor tumor development will establish whether it is a good therapeutic target. Photo: Dominka Kwasna and Syed Arif Abdul Rehman, first and second author respectively.